With our busy lives, we often feel drained and have little time to for fun. Taking time to breathe and re-center has become a crucial part of my daily routine, and I am a huge fan of Oprah and Deepak’s 21-day meditations. 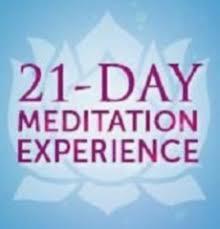 When I heard that Deepak was doing his own 21-day meditation, I knew I had to give it a try. If you are looking for a way to reconnect with the youthful spirit, join Deepak on this journey to maximize energy, live a healthier lifestyle, and tap into your inner youth, no matter your chronological age. The mediation stated today so I gave it a try this morning. I did miss Oprah at the beginning, but was grateful to be able to connect with Deepak as we explored our true nature and began to discover our path to health and happiness. Check out this free meditation experience, Energize Your Life: Secrets for a Youthful Spirit. which started today, Monday, October 29. You have five days to listen to the mediation, so it’s not too late to join. Thanks Deepak! Wonderful way to start my morning, and I’m excited for the next 20 days!